Bringing fondue back! 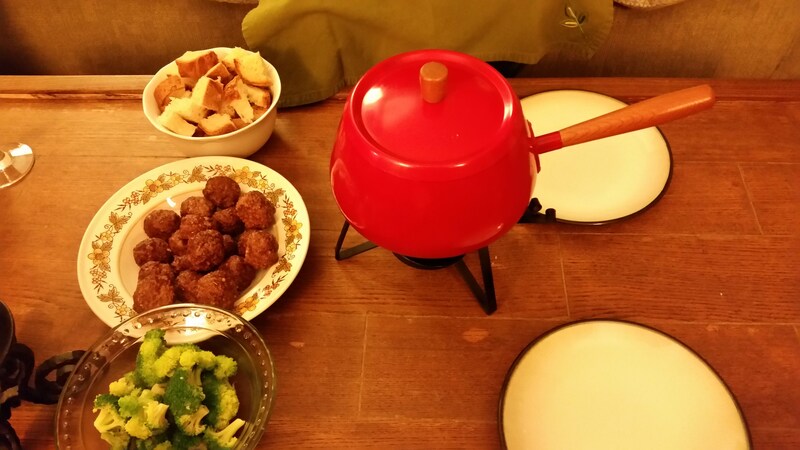 The above photo is our Christmas Eve dinner — an “uncheese” fondue (based on one in Jo Stepaniak’s book) with Olivia’s gluten-free vegan bread, homemade meatballs, and broccoli for dipping. I use that fondue pot way less than I’d like, one of my great thrift finds back in Bismarck. So! Recipes and links for the new year. This year, I (MaryKate) am amassing quite a stash of recipes I’d like to try but can’t because we’re moving right now. Not far this time — new apartment, same building. But still. Once we’re done (next week, can’t wait), I’d like to try this Crockpot Chicken Tortilla Soup, and this Slow Cooker Butterbean Minestrone. All I want to eat is soup, and I’m not even under a blizzard bomb or whatever is burying Denise out on the east coast. When it’s so damn cold in New Hampshire that I don’t feel like I need a coat (even if it’s just a spring fleece jacket because I’m so picky I can’t find a winter jacket I will tolerate) when it’s over 25 degrees Fahrenheit because it’s about 30-45 degrees warmer than it has been, I don’t even care about the snow anymore. Although I would like it to go away now. The cold makes me want to treat myself. I won’t tell you how many jars of caramel apple jam I’ve polished off in the last couple of weeks. I was thinking about tootsie rolls the other day, and I found this recipe. I’d have modify it for me to be safe, but it’s pretty close, so I might be able to make a version work. Although I don’t really eat much food that has more than an ingredient or two, if it has a label at all anymore, here’s an article on what to do if you think the label is wrong and you had a reaction as a result. Happy New Year, and may everything you cook turn out edible this year. Our wish for you.